Hello, we are a married couple that is somehow still happily married after more than 10 years. 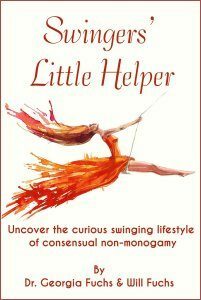 We have been enjoying our swing through the consensual non-monogamy community. Our experience hasn’t been perfect or 100% drama free but we are happy & confident we made the right decision for our life. For us, it was a good match and the positives have vastly outnumbered the humorous headaches that have popped up along the way. Just like any other couple we fight & argue but more importantly we strive to love & honor each other. Dr. Georgia makes good use of her PhD in psychology as she tries to figure out the latest crazy idea going through Mr. Fuchs’ mind. Please remember that even though Georgia is trained in psychology, she is not your psychologist. Everyone is different and rarely does a simple answer address everyone’s situation. For professional help with your relationship, please visit a marriage & family counselor. This site is not advocating any specific decision. We are just sharing our experiences & point of views that might be helpful, or at least entertaining, to other curious people. Hopefully, we can help you uncover insights to make a better decision and feel more confident with your own decision.